This is a series of articles I wrote a while back on the topic of Starting a BBQ Grill-Cleaning Business. I condensed all of them into one 11-chapter post so they can be read in order. While flipping through Small Business Opportunities magazine, I ran across a full-page ad promoting The BBQ Cleaner­™. Frankly, I thought it was a crazy idea at first, but for reasons unknown, I read the copy. At first, I thought the program was a franchise, something I am not interested in, but to my surprise, it was not. Instead, it was touted as a "business opportunity." The ad went on to say "You keep 100% of what you make and pay no ongoing fees!" Now that's the kind of biz opp I like to see. So I visited their website and requested more information. While I waited for someone to get back in touch with me, I Googled "grill cleaning Daytona Beach," and found very few results. A similar search for the Orlando area only yielded a handful of related services. Limited competition is a plus for any business. A couple of days later I talked with Jeffrey Krentzman, owner and president of The BBQ Cleaner. We discussed the business model, required investment, training, etc. 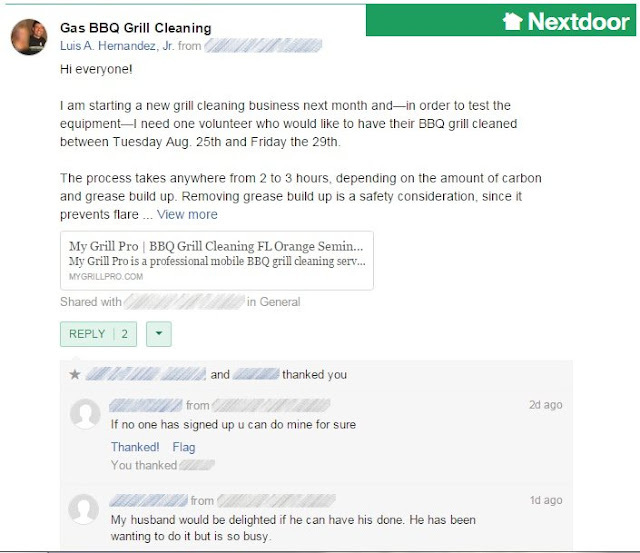 I asked him to send me more details as well as a few names and phone numbers of current businesses currently using The BBQ Cleaner system. Over the years I have learned that a salesperson will tell you only part of the story, while a business owner will, most-likely, have far more to say. I called several current operators in Florida, Missouri, Arizona, Texas and other states, and I was right. I got a lot of additional info. All of it was good. Everyone was helpful, open and candid about their business operations, the number of customers, and what they charge for their services. Very valuable information for me, which I quickly added to my spreadsheet in order to try to determine the break-even point, and also what I can realistically expect to earn. Numbers don't lie, and after factoring in salary, marketing costs and other expenses, I was pleasantly surprised to see that profitability was easily attainable, without breaking either the bank or my back. Another important fact: More than 80% of U.S. households own and use a grill. That's a lot of people. With my due-diligence out of the way, I requested the agreement/contract in order to study it for a few days. When that was done, I signed the documents and sent them to The BBQ Cleaner, along with a deposit check. The following couple of days were busy with visits to my accountant's office to figure out the requirements to obtain the proper permits, licenses, etc. With the licensing process underway, I started researching marketing services. These included vinyl wrapping the trailer and magnets for the truck, flyers, business cards, and EDDM (Every Door Direct Mail) mailers. The USPS offers one of the best deals for local businesses to reach residential and commercial addresses per zip code. You can research the service by visiting the EDDM page on their website. Once you determine the marketing area, you are able to see exactly how many households, businesses, or both, you can reach and for how much. You still need to use a commercial printer to produce the mailers, but that's easy nowadays. One caveat though; shop around and get several quotes for EDDM services, as printing prices can vary significantly from one place to another. The postage is a fixed amount, but most if not all printers will charge a fee for the mailing service. Those fees can vary greatly as well. I looked online at similar businesses in order to get ideas. Not very original I know, but there only are so many ways to say that you clean barbecue grills, and—after gathering a few ideas—I wrote down several potential names. A few days later, while having lunch with friends, I read them my list of name ideas. We all agreed that My Grill Pro was the best one. Later that same day I used GoDaddy to secure the URL. I also reserved the name on Facebook and with Google+ just in case, even though I do not plan to rely on web traffic to get customers. Frankly, the website and social media channels are more of a necessary evil in my opinion, and after having a website "Pandalized" years ago, I just won't put all of my marketing eggs in one basket. Actually, my plan is to spend as little as possible on the web-side of things. I even used a free blog service to serve as my website, something that most SEO experts and web designers frown upon. Everywhere you go you see ads for someone offering to build you a website, and if you own a new business, you get bombarded with emails of the same nature. 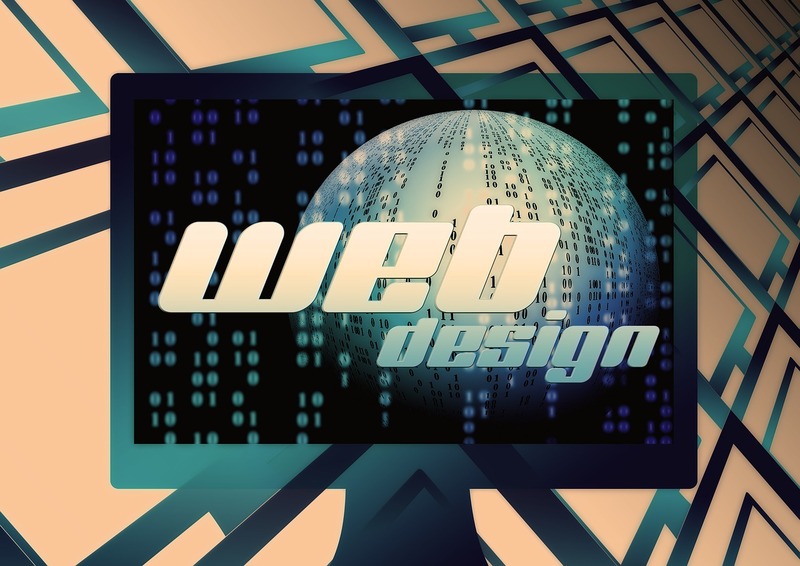 It seems everyone's convinced that you must have a website if you want your new venture to succeed. However, that's not entirely true. A few years ago my online bookstore was "punished" by Google's Panda algorithm, and after that experience, I vowed that if I ever decided to start a new business, its success and—most importantly—its profitability, would not depend on a website. When I finally decided to start a new business venture, buried at the end of the "to do" list, was having a web presence. So when the time came to have this done, I hired a local company that specialized in creating websites. We met and I explained that I wanted a simple site with, maybe, four or five pages, some photos, and that sort of thing. After a few days, they called to say that my new website was ready. After I fired them I talked to a few other website designers. But the prices I was quoted made no sense whatsoever, so I decided to build one myself. Not my favorite thing to do but—since I built my first web page from scratch back in 1994—I sort of have a pretty decent idea on how to go about it. For the platform I chose Blogger. Yes, Blogger is a blog platform but—like anything else involving HTML, CSS, etc.—it can be customized quite a bit. Besides, I've been a Blogger user for years now, so I am somewhat familiar with it. Now, webmasters and—especially—SEO "experts" everywhere will say that using Blogger to create a business website is the wrong thing to do. The beauty of it is that I don't care. 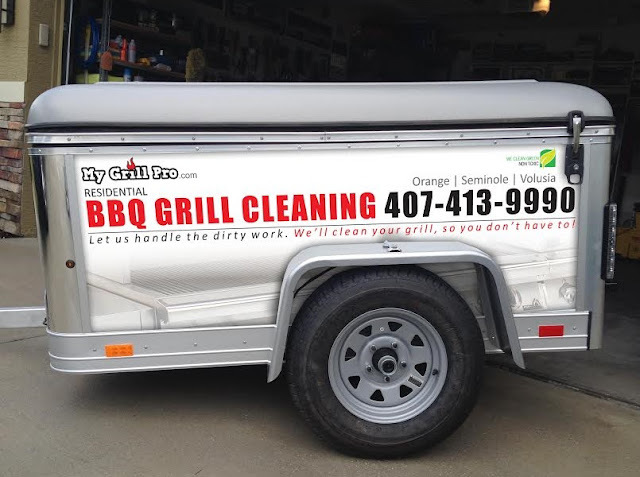 I just needed a basic website for my barbecue grill cleaning business. I've said it before and I'll say it again: Having a website is a necessary evil, at least in my case. I am not counting on customers finding me online. If they do, great, but I will not depend on it. If my new enterprise had an e-commerce component, I would be singing a different tune. But since my new business is a local grill cleaning service, I plan to reach potential customers in more traditional ways. These include postcards through USPS's EDDM (Every Door Direct Mail), subdivision newsletters, and ad books. In addition to those advertising channels, I will have my equipment trailer vinyl wrapped and have custom magnets made for the truck. Because of the nature of the service, I plan to take advantage of the fact that while on a job, my truck and trailer will be parked in front of the customer's home, and while I am there I can use my vehicle to advertise my services to neighbors. It is liberating not to have to depend on web traffic in order to have a successful business. This morning I received a phone call from Ceva Logistics in Orlando. My trailer had arrived and it was ready to be picked up. Since the terminal is about an hour away from my home, I thought it would allow for good real-world driving practice, and it certainly did. Jeff (of The BBQ Cleaner™) had suggested I bring a crowbar and a hammer in case I needed to uncrate the trailer. I brought one of my toolboxes with me just in case, along with a 3 lb. sledgehammer. That was a smart decision. The guys at the terminal were very helpful allowing me to uncrate the trailer right in their back parking lot. They even carried the crate with a forklift to a shaded corner. That was greatly appreciated since it was another hot and humid Central Florida day. I had a friend with me (another smart move on my part) and we spent the next 45 minutes taking the crate apart. This involved—mainly—the crowbar and sledgehammer. The trailer is quite small, so once it was out of the crate, I moved it by hand and positioned it near my truck. The only assembly required was inserting the tongue into the trailer and installing the license plate. I also installed the ball mount with the 2" ball into my truck's receiver hitch and pushed the coupler into the ball. When that was secured, I installed the safety chains (they are included with the trailer) and plugged the 4-pin flat plug to the connector under my truck. Most new trucks that come with a towing or trailer hitch installed at the factory, will have a 4-pin flat connector as part of the hitch wiring. Look and trace the path of the wiring harness under the trailer hitch for it. If one is not available, you can have one installed at most trailer shops. Instructions are also available online for do-it-yourselfers. One note worth mentioning: When I purchased the ball mount at my local auto parts store, I made sure they knew what kind of truck I have, especially since mine had the SLT package installed at the factory which included 20-inch rims. This makes the truck pretty tall, so they recommended a hitch ball mount with a 5-1/4" drop, which works perfectly with the Wells Cargo MPT461. So make sure to purchase the right ball mount for your particular application. The Wells Cargo MPT461 is a small trailer, and that poses a couple of challenges that are mastered over time. First of all, I can barely see the trailer when driving down the road. I may have to install something in order to have a visual reference that it is back there, as it is a bit unsettling to be towing something and not be able to see it. The second issue reveals itself when backing up the trailer. Again, I can only start to see it once I turn the wheels all the way to either side and am in the process of backing up. No big deal, but because of the lack of visibility, it is hard not to jackknife it. I guess in time this won't be an issue anymore, but speaking from experience, it is harder to maneuver a small trailer in reverse than it is to maneuver a large one. As far as driving forward, there are no issues whatsoever. Again, because of its small size, wide turns are overkill, for example. For the most part, you don't even feel like you're towing a trailer. This, of course, is great news for anyone who wants to use a small vehicle for towing duties. I am pretty sure a Toyota Prius would have no problems handling that job. The trailer arrived packed with some of the items needed for cleaning grills. The biggest items include the dip and rinsing tanks, a shop vacuum cleaner, a toolbox, and a large bucket. Other items include a fire extinguisher, a tarp and a bunch of cleaning products. On my way home, I stopped by AlphaGraphics in Lake Mary since they will be doing the wrap for the trailer as well as magnetic signs for the truck, and they wanted to measure the trailer to make sure the wrap would fit properly. They did notice a few stickers on one side of the trailer which would interfere with the vinyl wrap, but I told them that I would try to remove them and relocate them on the front side of the trailer since that area will not be wrapped. Once I got the trailer in my garage, I used my heat gun to soften the adhesive and I carefully removed the stickers and repositioned them to an area that will not be covered with vinyl. I am quite happy with the fact that the trailer is small and light enough for me to move it by hand in order to get it in my garage. And because of its small footprint, I still have plenty of access to everything around it. After cleaning a certain number of barbecue grills that have accumulated their fair share of carbon and grease—plus all sorts of grime associated with equipment that is kept outdoors—the resulting wastewater must be disposed of at some point. Because of the water, combined with eco-friendly cleaners used in the process, as well as the organic nature of the cleaning solution byproduct, the wastewater is not detrimental to the aquifer, as it was explained to me by the Wastewater Disposal Specialist for the city of DeLand. Having said that, the local water treatment plant does not offer a way for me to dispose of the wastewater at that location. And the same applies to the local waste and recycling center, although there is a landfill, about an hour away, that does accept liquid waste. But that one is just too far, for it to make practical sense. So the issue of how to get rid of about 20 gallons of the gunk once or twice a month, remains. I even called Volusia County and exchanged emails with the Volusia County Environmental Specialist who offered a few suggestions as to who to talk to. One of the contacts suggested that I dispose of it in my backyard, and to sprinkle lime (calcium hydroxide) if the odor was an issue. I was told again that, since the solution does not pose a threat to the aquifer, this is not a concern. However, since I live in a sub-division, that isn't the best option for me. The other suggestion was to dispose of the dirty water at a local self-serve car wash or, alternatively, talk to someone at a local restaurant since they have a grease trap. The car wash idea seems reasonable since they are required by the county to have a system to process the wastewater they generate so I will explore that option. 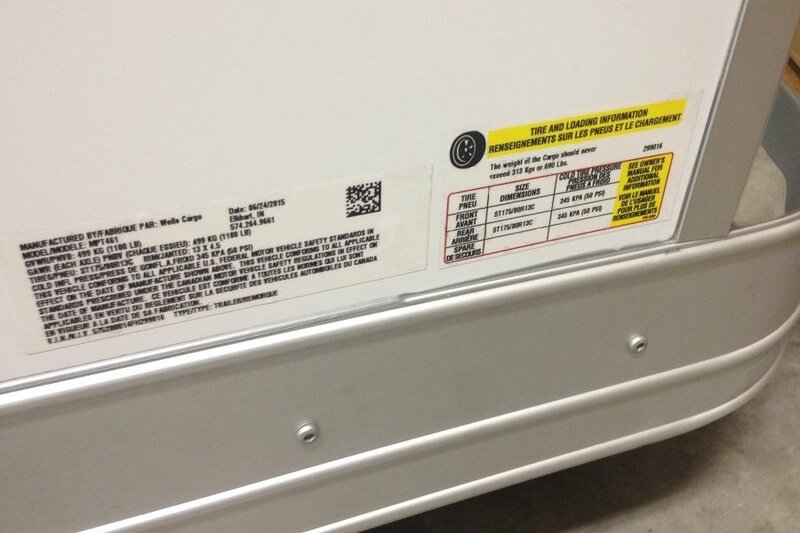 If you are doing research on launching a grill cleaning business in your area, please keep in mind that environmental laws and regulations vary from state to state, and also from county to county, so make sure you talk to as many people as you can in order to determine what will be required of you, as far as disposing of wastewater. Jeff Krentzman, President of The BBQ Cleaner, arrived at my home at 9:00 a.m. a few days ago, ready to go over all aspects of the business as well as a hands-on session of using my new equipment to actually clean a grill. By noon, we were ready to get lunch so we went to a local restaurant. 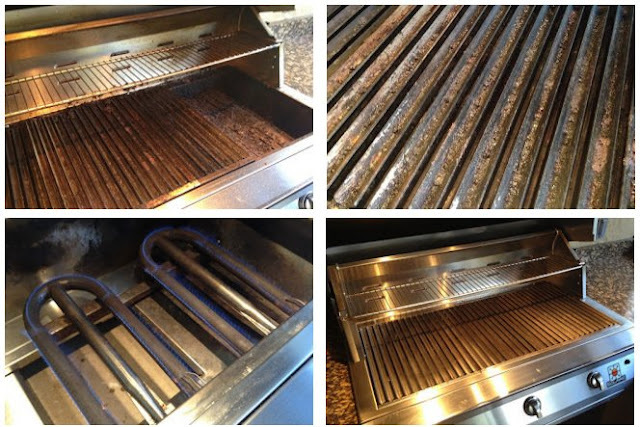 Jeff shared many stories about his experiences about cleaning grills, as well as things he's learned from the hundred-plus business owners who have purchased The BBQ Cleaner system. At around 1:30 p.m. it was time to get the cleaning process started. Weather in Florida—this time of the year—really is a crap-shoot, as blue skies can quickly become dark and menacing, with thunder, lightning, and rain, especially by mid-afternoon. We got the steamer tank ready and walked to my backyard since our own grill was to be the first one I cleaned. And it desperately needed some attention, I am embarrassed to admit. I will spare you a step-by-step account of the process, but I will say that I am amazed at the amount of grime an outdoor grill accumulates in a little over a year of use. And all this buildup was the reason our grill was smoking so much every time we lit it up. Flare-ups were starting to be a problem, as it is impossible to properly grill a piece of meat when the heat is uneven. After applying the degreaser solution, the layers of fat and grime started to soften, and we scraped as much of the stuff as possible. And here's a pic to show you just how much of it you can get off the surface by using the right tools and cleaners. Once the unit was as clean as possible, we reassembled and tested it, to make sure the burners were unclogged and burning properly. I also made a mental note to order new "flavorizer" bars from Weber since mine are pretty rusted, albeit clean. The last step was to polish the grill, and this brought it back to life again. There's only so much you can do with cooking surfaces, as metal tarnishes, discolors, corrodes, stains, or a combination of all of the above. But my Weber is now clean and grease- and smoke-free. 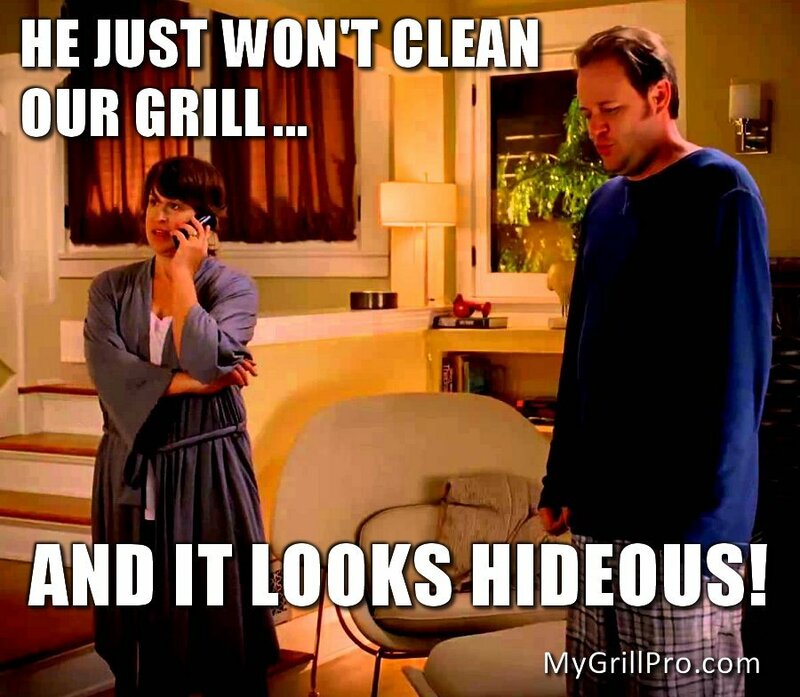 But a clean and shiny grill does not mean that you're done. Far from it. You still need to clean the work area, bring tools and supplies back to the trailer, and then, you have to clean your equipment so it's ready to be transported back to home base or the next job. That's not a big deal, of course, but doing so in the afternoon Florida heat and humidity isn't pleasant. After all the equipment was clean and back in the trailer we stepped back inside. Thank God for air conditioning! Jeff and I went over the cleaning process again and talked about a few other items before he drove back to his hotel near Orlando International airport. So far, everyone who's seen my clean grill has been very impressed, which is a good sign. And now I feel confident enough to start taking care of local customers. As a matter of fact, while I was going through the last part of the training session, I took a few minutes to answer a couple of calls that came courtesy of one of my EDDM (Every Door Direct Mail) campaigns, and I now have three customers on the schedule already for next month. A great way to end Grill Cleaning Training Day! I am sure you've heard that old saying many times before, but I've always believed that PERFECT Practice Makes Perfect. In other words, you can practice as much as you want, but if you're doing (and practicing) something the wrong way, guess what... the end results may be far from perfect. After reading The BBQ Cleaner's Operations Manual a couple of times, and then going through Training Day, I felt a lot more confident about my capabilities of cleaning any grill. After all, this is not rocket science. Having said that, I want to do an excellent job for all customers, so I felt I needed to have at least a couple more cleanings under my belt. 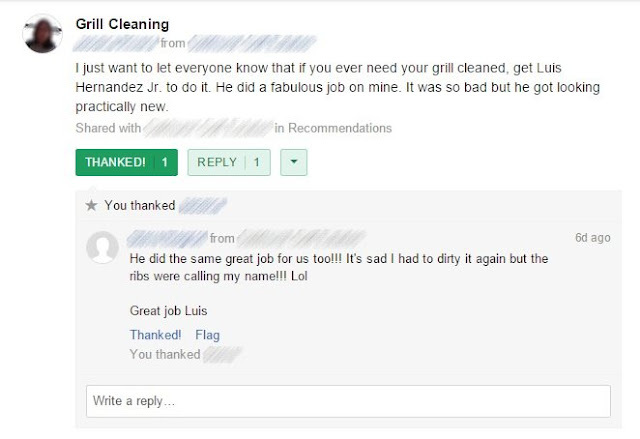 To that end I posted a message to my neighborhood's NextDoor group, offering a grill cleaning free of charge, I immediately got replies from a couple of volunteers, and we scheduled the appointments. 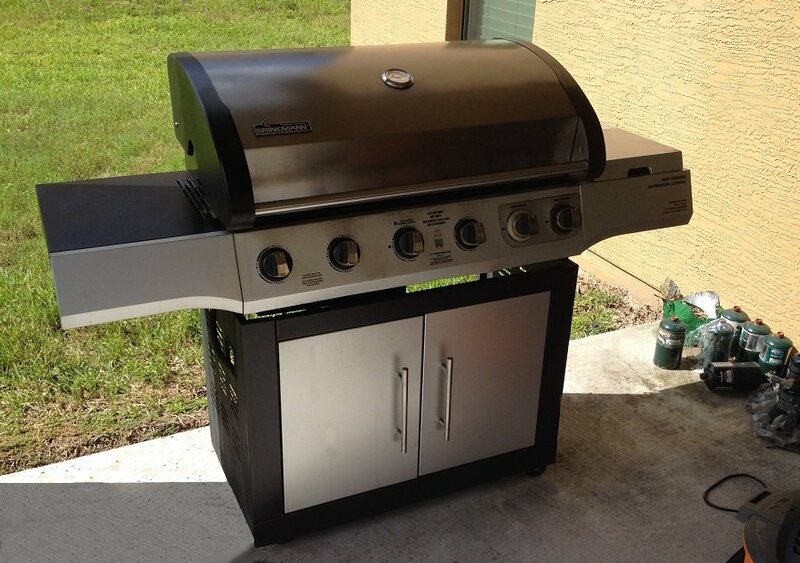 I think it is very important to do one or two practice cleanings on grills that belong to complete strangers. This way the process is "real" versus cleaning a relative's or friend's grill, for example. But if you don't have a forum such as NextDoor to reach out to neighbors, you can still walk around your area and talk to homeowners so you can explain what it is you are offering. No one likes to clean their BBQ grill so you will not have any problems finding volunteers. Once the appointments were set, I got my equipment ready, knowing that I would learn a few things as to how to conduct the cleanings, how to talk to customers, what products or tools I may need to add to my toolbox, etc. I arrived on time for both appointments, which is something that is very important. You do not want to keep customers waiting around for you, and even though these were freebies, the idea was to treat them just as if they were paying for the service. Once on site, the customers will pretty much leave you alone so you can get the job done. There's nothing glamorous about cleaning grease and carbon buildup, so you'll have the time to get familiar with the grill and assess the amount of work that will need to be done. Most importantly, practice cleanings will allow you to determine which cleaning approach works best. At least they did for me. I will spare you all the procedural details since, if you are starting a BBQ cleaning business as an authorized tech of The BBQ Cleaner, the ops manual will give you a very detailed overview of the process. In addition to that, Training Day will also cover that part in a hands-on fashion so you will have a solid basic understanding of how to get the job done. In addition, if you follow The BBQ Cleaner's system and use their products, you will attain good results, and your customers will be very pleased when they see how clean their grill is. But ultimately, you want happy customers, and from the unsolicited post I saw later that day, I was very happy to see that my efforts had paid off. If you follow the suggested steps and take your time, the results will be pretty amazing, and who knows... your customer may be so happy that they will insist on giving you a tip for a job well done. I'm just sayin'. Getting any business off the ground is challenging. And doing it on a small budget can be daunting. But at the end of the day, and as the old axiom says, it takes money to make money. If someone believes that a free website combined with a dose of social media is the cure to the advertising ills, they are in desperate need of a reality check. A business needs customers to stay busy and, ideally, return a profit. And so I turned to "old media" in order to reach potential customers or prospects, and my first effort involved an EDDM campaign. EDDM is short for Every Door Direct Mail, which is a program of the United States Postal Service. A well planned EDDM campaign can be both affordable and very effective. Unfortunately, in my case, my first effort was not successful. Out of a grand total of 4,624 (6½ x 9-inch) postcards, I only received 4 (yes, FOUR) phone calls. Only three of those calls resulted in actual paying jobs. Talk about a flop! But I am not blaming the USPS for this. After talking to other grill-cleaning operators, I am learning (the hard way), that the month of August usually is the worst month in this industry, followed by December. I guess the end of summer keeps most people focused on other things. Of course, that EDDM campaign wasn't the only marketing approach in my arsenal. I also signed up an agreement with a local ad magazine that offers a far larger monthly distribution (10,000 homes), in the same demographic group. The first issue, with my ½-page ad, went out a day or two ago, and I've already received two calls, one of them an actual appointment for next week, at a cost that is a fraction of what I spent on my first EDDM campaign. As a matter of fact, that one job pretty much covers the cost of the ad. I also found another local ad magazine, which has a much larger circulation in surrounding areas that I'd like to reach and, again, for a fraction of what an EDDM campaign would cost. 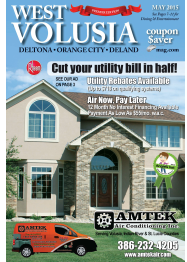 I can reach 35,000 homes, mostly in West Volusia county (where I live), also with a ½-page display ad. The other reason I like these type of magazines—versus stand-alone EDDM postcards—is because the great majority of the ads are home-improvement related, which (hopefully) means that homeowners, looking to have some work done, will keep them around for a while. 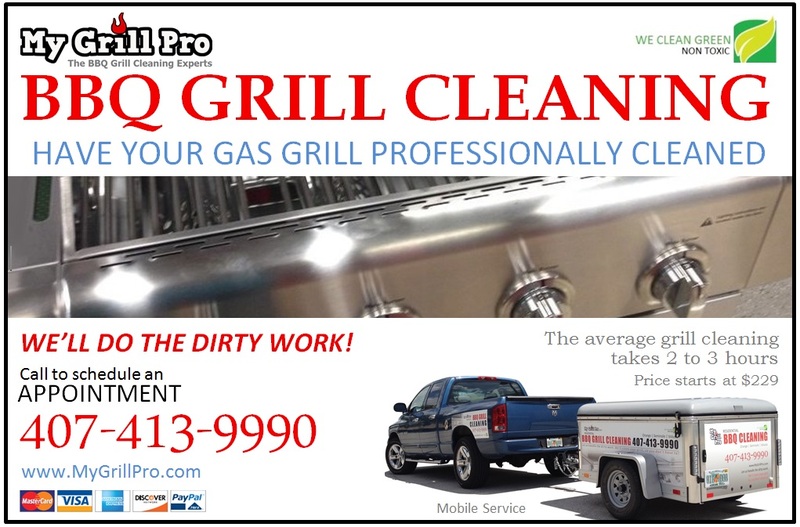 Plus, I am the only one advertising a grill cleaning service. After meeting with the publisher of the West Volusia ad magazine, I decided to let them create an ad for me since she made some valid points when studying mine. We also made the decision to list the price of the service, since the ad copy will explain that the process can take up to three hours at the customer's home. Listing the price also serves as a filter to keep those customers who are not willing to spend the money if their grills are the throw-away kind. My first job was to clean a built-in Viking Professional grill, part of an outdoor kitchen in a beautiful back yard, right next to the swimming pool and tennis court. When I was done—the job took about 2½ hours—the customer was ecstatic and asked to be put on the schedule every three months! The following two jobs also resulted in very happy customers who want to receive service reminders every six months. Another important part of marketing has to do with presentation. I invested in having my company's logo digitized and had golf shirts embroidered, which looks professional. I also had the trailer covered with a very nicely designed custom vinyl wrap, along with custom-cut magnets for my pickup truck. As I drive to and from jobs, I notice people look at the trailer, and I hope that some will eventually call to set up an appointment. Also, last week, as I was getting my equipment out of the trailer for a job, a woman walking in her neighborhood asked me for a business card, so the vinyl wrap and magnets work. 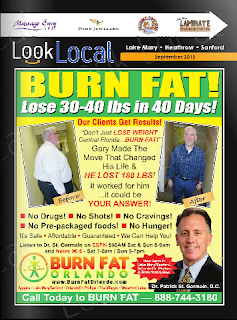 During the starting phase, I will use a combination of EDDM and print advertising, which I hope will allow me to service enough monthly customers to reach the break-even point so I can build from there. This is why it is so important to create a spreadsheet where you can list all the monthly expenses so you can figure out how many jobs you need to perform daily in order to reach profitability. Business—large or small—is a numbers game, so make sure you know your numbers well. Then figure out a way to control those numbers, not the other way around. Once you launch a Facebook page for your business, you can't help it but wonder where the "Likes" are going to come from. And while they do, they seem to take forever and a day to materialize. 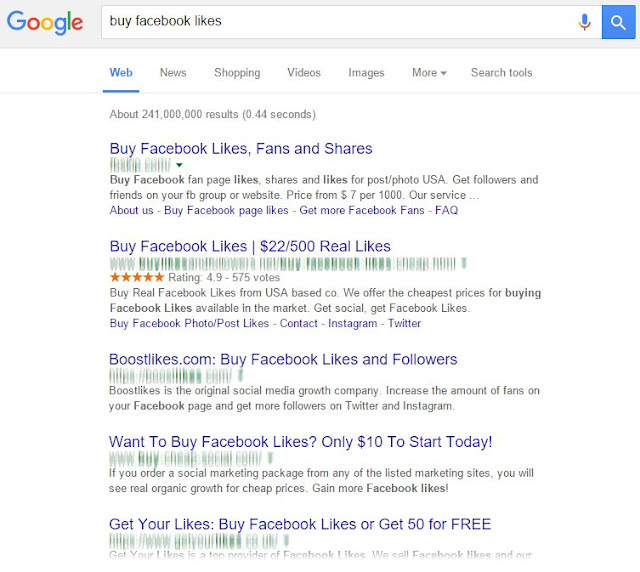 You may even look at other business pages boasting hundreds or even thousands of "Likes," and you probably wonder how they did it. The organic or natural approach takes time; usually a long time. Especially when you own a small business that serves a local clientele. There's nothing wrong with growing your fan base slowly and steadily, but if you are like me, and post at least a few times each week, you cannot help it but feel like you're talking to yourself. Option number two: The paid approach, which can be broken into two segments. "Likes" you purchase from a broker. "Likes" you purchase through a Facebook ad. In my case—and as an experiment—I chose to use the second approach. Okay, the fact that I only had 12 "Likes" was reason enough to find a way to (legitimately) bolster my Facebook "fan" base. The first option, which involves buying "Likes" from brokers or companies that offer hundreds or thousands of "Likes" for a few bucks, is useless in my opinion. Sure, they can make your Facebook page look impressive in a matter of days (if not hours), until you realize that there's absolutely no engagement or participation at all, big numbers notwithstanding. This practice can have a negative effect on how your site ranks, according to many search engine optimizers, and trust me, you do not want to rattle the Google cage when it comes to "creative" SEO practices. But if you decide to pursue this venue, regardless of the possible negative consequences, you have PLENTY of places to buy from. The second option is totally legit and it can certainly help augment your Facebook numbers as well as participation by helping you acquire individuals who may have a real interest in what you are offering. When you buy a "promotion" through Facebook, you can pick and choose the target audience you want to market by age, interests, and location. 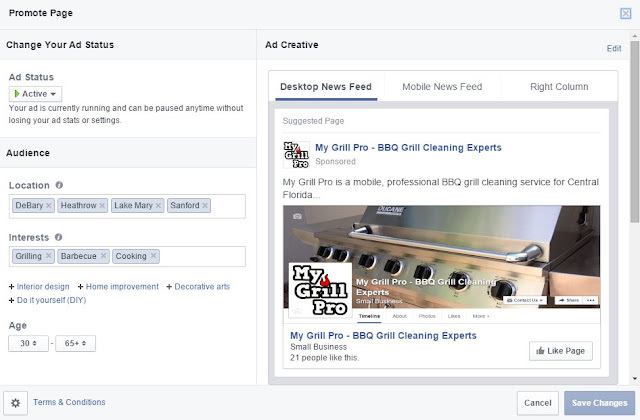 By doing so, you are guaranteed that those who see your ads are pre-qualified. At least in theory. You can also edit your promotion as needed and at any time, which makes this approach very user-friendly. Plus I also like that you can start your promotion for as little as $5 a day, and you decide how long you want your campaign to run for. You can also temporarily pause or completely stop it as needed. 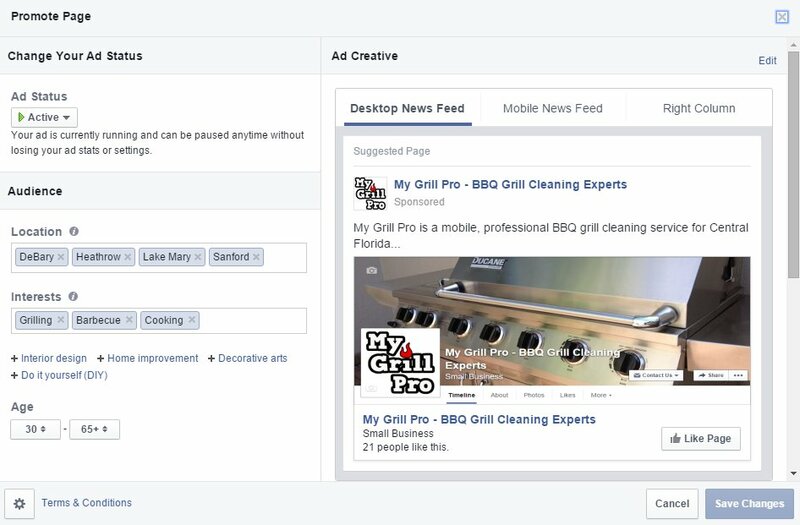 Getting a promotional campaign started on Facebook is very easy. And as the screenshot shows, you can also set one up to promote your website. You will need to set up some form of payment, then it's a matter of a few clicks and your ads are created on the fly. Once they are approved (takes about 15 minutes), you're good to go. For my business, I chose to allocate $5 per day, and for a period of two weeks. The results of this promotion were decent, with a total of 100 "Likes" from a total investment of $55.06, at a cost of about 55¢ per each new "Like." 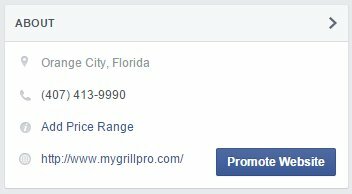 From looking at the profiles of those who "Liked" My Grill Pro's Facebook page, I can see that most are from the Central Florida area. However, the coverage radius seems to extend far beyond from the cities I listed in the "location" field when I designed my ad. I've seen "Likes" from Orlando and Kissimmee, for example, which are areas I do not serve. So even though, so far, the geo-targeting parameters used by Facebook seem to be a bit "generous," at least they are in the general vicinity, albeit not exactly where I'd clearly indicated when I created the promo. "Engagement" so far, or lack thereof, seems to be in line with what you would expect from buying bulk "Likes," so I am not sure these "fans" will actually help my Facebook page. 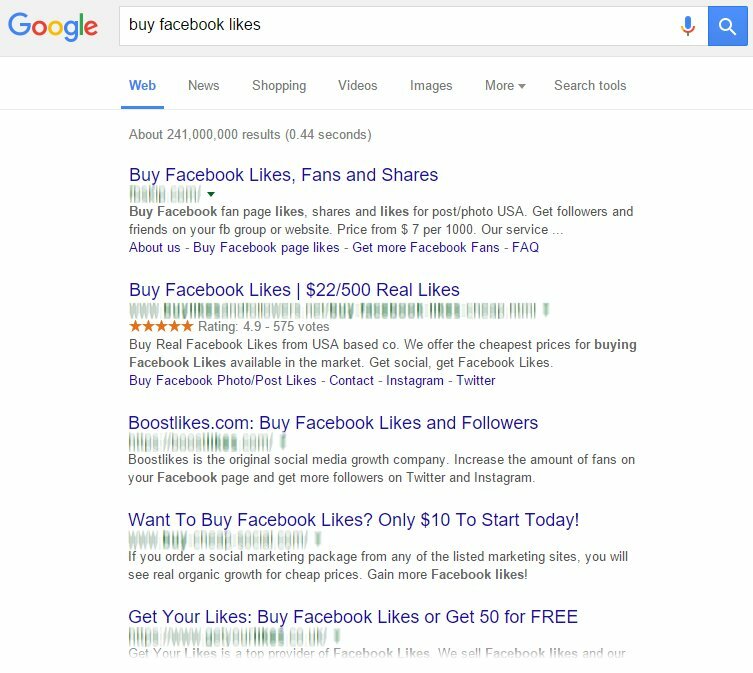 Ultimately, buying "Likes"—from any source—should be looked upon as a quick and easy way to get over the 100-Likes-barrier and nothing more. Only time will tell if having a Facebook page, or any other social media for that matter, will make a positive difference as far as profits are concerned. Personally, I am still very much on the fence at being able to discern the value of spending effort, time and money in social media. I hope it helps make my website more prominent when it comes to search engine results, but that's about it. It seems to me that whatever algorithms Facebook uses to target potential business fans, are more in line with those you would use to find potential friends. Filters such as household income, for example, would be extremely helpful for those of us who are targeting specific demographics. And if I am given the opportunity to select specific areas, well then my "Likes" should be limited to those cities. Again, My Grill Pro services residential customers in Seminole and Volusia counties at this time, yet many of the "Likes" are for people who live in Orange and Osceola counties. Granted, both located in Central Florida, but if we do not travel to those areas, what's the point? If you want to quickly augment the number of "Likes" for your Facebook page, I would recommend using the Facebook built-in promotion system rather than those offered by brokers. I am pleased with the results of this experiment. 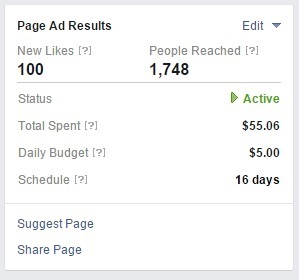 I started with a grand total of only 12 "Likes" and, by the time I paused the promotion, that number had increased to 112 in about a week and a half. But then again it goes to show you that "Likes" can be easily manipulated. So, when you look at your competitor's website, you have to question if the numbers shown are natural "Likes" or not. When all is said and done, all you get are meaningless numbers. As any business person knows, it is easier (and cheaper) to upsell an existing customer than it is to find a new one. And with that in mind, you may want to consider offering a few related services to your clients. This allows you to make a bigger sale at the time of service without the need for an additional trip, which saves everyone time and money. A few customers may want—in addition to their BBQ grill— their vent hood cleaned. Those can be a bear to clean, which is the main reason why I charge a premium for that service. First of all, you'll have to contort your body in funny and unnatural ways in order to reach those areas; and secondly, most ventilation hoods have grease traps (or baffles) that are never cleaned, which means you'll have to spend a lot of time getting them free of gunk. The baffles or filters are intended to keep grease from entering the ventilation ducts, and they trap quite a bit of grease. They can be cleaned in the dishwasher (by themselves), but very few people know or do this, so they end up clogged with grease, which is a fire hazard. If you decide to tackle a vent hood, be prepared to spend at least an additional hour cleaning it. And if the baffles are made out of thin aluminum, DO NOT throw them in the hot tank, as any strong solution may etch and, possibly, discolor them. If the outdoor kitchen area has a sink with hot running water, ask the homeowner if it's okay for you to use the sink to wash them. The degreaser will help loosen most of the grease, and you can also use any dishwashing detergent to get them as clean as possible. Just be patient and soak them for as long as possible, as this will make your life easier. Then use a sponge or shop rag as you rinse them, in order to remove stubborn grease. You will also need a step ladder in order to reach the vent hood. I usually borrow one from the homeowner, if they have one, or use the large bucket supplied with the equipment so I can reach the vent adequately. I just turn it upside-down and it allows me to reach most vents comfortable. Not the safest way to do this, but it has worked well so far, although I am thinking about buying a small 2-foot step ladder and keeping it in the trailer. The spray stainless steel cleaner by Ovenu and available to The BBQ Cleaner techs is a fantastic product. The moment I used some of it to polish our s.s. fridge, stove and dishwasher, I lost a bottle to my girlfriend who was amazed at how beautiful the appliances looked. The product is formulated not only to clean—and it does an excellent job at that—but also to return a factory sheen that I had no idea was possible. I've used plenty of other products over the years that come labeled as polishes for stainless steel appliances, but they always leave streaks which look horrible. On the other hand, the cleaner/polish by Ovenu leaves no traces and evens out the whole area being treated. Plus, its anti-splatter properties make clean up, easy. Retailing at $39 for a 16.9 oz. bottle, the Stainless Steel Cleaner & Polish is not cheap. However, to the average homeowner, a bottle of the product will last at least a year, if not two, since a little bit goes a very long way. Besides, when your customers see how beautiful the grill and vent hood look when polished, they'll want to know where they can buy the cleaner/polish solution, and you can make another sale. Keep in mind, however, that items such as the stainless steel cleaner may be subject to sales tax, so check with your local and state taxing authorities to make sure you are reporting those sales appropriately. Alternatively, you may also want to offer stainless steel appliance polishing services to your customers. This would also allow you to bring the total of the sales ticket up, without adding too much time to the job. The list of online business directories is long, and it is obvious the major search engines put a lot of trust on them—at least as far as I can deduce—by seeing how high biz directories rank when you conduct a search for a specific business, especially small businesses. A while back I created a very basic website for a friend of mine who needed one but lacked the financial resources to have one professionally designed. I built his in a matter of hours thanks to a customized Blogger template. After a few weeks, I checked Google to see if his new site was ranking at all. It was, but it was buried so far down the list as to make it near impossible to find. But it was a start. However, I did notice right away that business directories, such as Manta, Yellowpages, and others, were ranking for my friend's company name and on the first page for that specific search. I contacted most of the directories in order to update some of the info they had, which was both dated and, in some cases, wrong. Fortunately, the great majority complied in a timely fashion and that had—I believe—a positive effect on the ranking of my friend's "official" website. 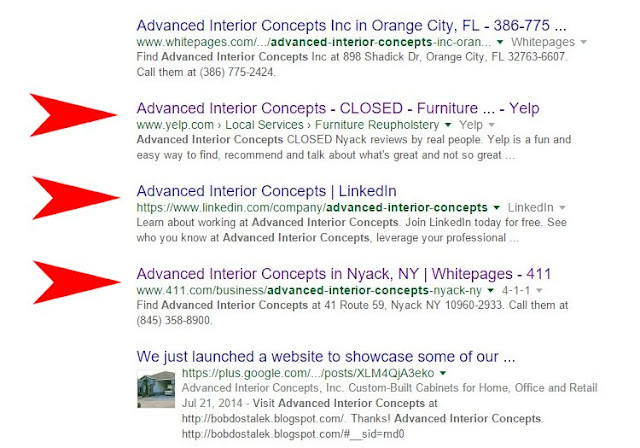 It's been about a year since I created the Advanced Interior Concepts website, which now ranks number 1 when you search for it by name, even though my friend didn't even spend the ten or twelve bucks to get his own domain name. The URL still reads bobdostalek.blogspot.com, which is okay for a personal blog, not so much for a business. Also, when I created the site for my friend, I set up a Google+ page for him, knowing that having such page would help with rankings, and from the image below, you can confirm this. It's also interesting to notice on the image above, that both the yellowpages.com and manta.com links still rank very high, which helps illustrate the point as to why it's so important to register your company with such directories. 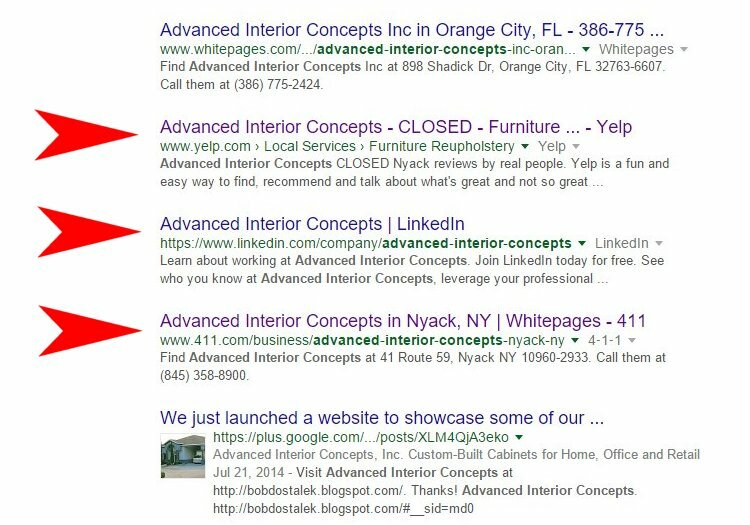 Down the same page, appear three listings for a company with the exact same name but located in New York state. From the Yelp listing, it appears that company closed its doors, which does not look very good if someone who is searching for Advanced Interior Concepts in Orange City, Florida, thinks they're one and the same. So if you have not registered your company with as many of the local business directories as you can find, or at least with the largest ones, you may end up in a similarly confusing situation. The good news is that you can register with these directories at any time, to make sure they have up-to-date information about your biz. That way when they get spidered by Google and Bing bots, the search engines will know what info goes where, and those instances will start to vanish. The list keeps getting bigger every day, but there always are a few that are a "must," in my opinion. For starters, popular sites such as Angie's List, Yelp and HomeAdvisor are essential for small businesses. Even Google (in partnership with another company) has been making inroads for a few years now, albeit in a slightly different direction, with Get Your Business Online. And like I've mentioned in previous articles, a business page on LinkedIn should always be a consideration. 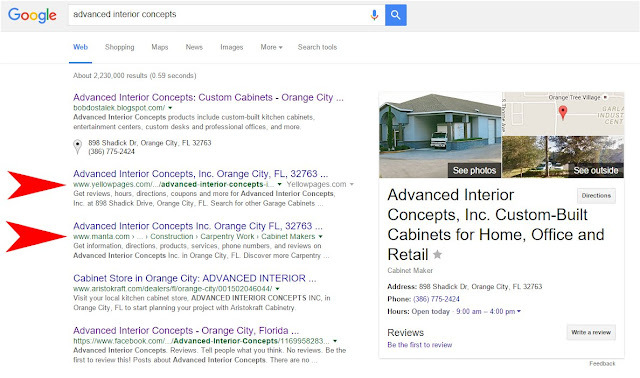 And let's not forget Google My Business and Bing Places for Business. Directories like Manta and services such as Moz Local, for example, help you automate updates to a group of directories... for a fee. But that is something to consider as it not only saves you time and money, but it can also guarantee consistency of your listing across different directories. Thanks to popular small business websites such as Angie's List, HomeAdvisor, Yelp, and Get Your Business Online, combined with business directories such as Manta, YellowPages.com and dozens more, there's no reason why your small business cannot rank high for select search terms as well as the name of the business itself. Getting listed in most of the sites mentioned in this article is easy. And with the exception of automation tools as those offered by Manta and Moz Local, most offer a basic free listing. You will encounter a few sites that require payment, but that's a decision only you can make based on what your research may tell you. As the number of small businesses trying to secure a web presence continues to grow, you'd be smart to formulate a plan of action and make the time to get your business listed properly on as many business directories you can find. Again, most will list your basic information free of charge, while others will extend offers to "enhance" your listing. You DO NOT need to be listed on every single directory out there, but the main ones are almost mandatory, in my opinion. By doing so your business may start to rank high on search engines, and that can have a huge positive impact on your bottom line. We all have a certain degree of control when it comes to being found online. And now you know a little more on the subject. This is a question that many small business owners seem to lack an answer for. And what I see during my Internet travels, are a lot of social media channels that seem to be clogged with pretty much useless, self-promotional posts that totally fail to create any sort of engagement with the audience. That's only one side of the coin, of course. On the other side, you find a variety of sites that hardly offer any content at all. Consequently, a lot of social media channels end up sort of abandoned. This reflects badly on the business, and the lack of updates may have negative SEO-related consequences. So what can a business do? What can you post? And how often? Those are the questions I hear every once in a while, and my answer is pretty basic... even simplistic. Nicely, of course, but talk about what your business has done for them. Have them pose with the product they bought from you and snap a pic for your social media site, for example. If your business offers pet grooming services, take photos of their pet and plaster them all over your Facebook page and share that with them. Nine out of ten times, they will share those photos with their friends, and the social media circle is then complete. If you paint houses, take Before & After photos and—again—post them for the world to see and let your customers know. And the same applies whether you clean windows, detail cars, sell collectible toys, own a hair salon, etc., etc., etc. Every time I clean a grill, I take before & after photos. And when I get back home, I post them to several social media channels I maintain for My Grill Pro. Since I've been doing this type of work for years, it's become quite easy for me to take care of several channels in a matter of minutes, and the reason I post photos of jobs I've done for my clients, is to show prospective customers what it is I have to offer, and I let the photos do the selling. I don't use a whole bunch of text to describe the cleaning process step-by-step. Instead, I mention the grill brand and model, a few things I might have noticed during the cleaning (rust, lots of build-up, etc. ), and the city and neighborhood where the job was done. I do this for SEO reasons. By the way, do I have any proof that this helps with my SEO efforts? However, MyGrillPro has gone from not being listed on major search engines at all (I launched the site about 2 months ago), to ranking very well for my desired search terms. But again, I have no idea if my social media posts are the reason for that. Personally, I believe they have helped a lot, and the page rankings support that, but I have no specific proof. Laughter—as they say—is the best medicine, and when it comes to social media it can help remedy the "boring post" ills. The easiest way is to find cartoons related to your business and post those (as long as you don't attempt to claim them as yours), on your Facebook or Google+page. There are thousands out there, you just have to make the time to find and save them. Then credit the source as needed. Needless to say, some may be offensive, so you will have to decide which ones are okay for your page. Another option is to find industry-related memes. But as with cartoons, you want to make sure you respect the author's creative rights. And you can always try to get creative yourself and make your own memes, which will be a bit more time-consuming. However, you can customize those to your heart's content. How much is too much? I cannot answer that question, but let me say that posting without a specific purpose is a waste of everyone's time, so make your posts count. Even though I don't have a set rule, I only make a social media post when I have something of value to share. Whether I am posting grill cleaning photos, cartoons I like, or memes I find or create myself, I tend to space the frequency of posts by a day or two, sometimes longer. I certainly don't want to give the impression of being a social media spammer, and I also understand that the subject matter I deal with is not the most interesting in the world, so I post sparingly, and so far that approach seems to be working. The one thing I do is respond to either comments or direct messages in a timely fashion, and so should you. If you take a lot of photos, you may want to create a Pinterest or Instagram page for your business. Since I've been a Pinterest user for a few years, I am familiar with the platform so I chose to create a Pinterest page for My Grill Pro. As with other social media sites, the post frequency is totally up to you. The thing to keep in mind is to use consistency when it comes to whichever social media channels you develop. As I've mentioned a couple of times, the frequency of posts is not that important. A constant flow is. So whether you do this a few times a day or once a week, try to be consistent. Just don't allow your social media pages to become stagnant. I hope this article was helpful, and thanks for reading. Copyright © by Luis Hernandez, Jr. All Rights Reserved. Simple theme. Powered by Blogger.